Nationally, employment projections are encouraging for the Class of 2015. 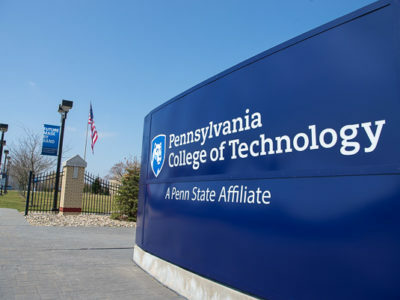 Recent career fairs at Pennsylvania College of Technology reflected that positive reality. Approximately 210 employers offering more than 2,400 jobs and internships participated in the spring career fairs at the college’s main campus and Lumley Aviation Center. The number of employers, including several Fortune 500 companies, was an all-time high, according to Erin S. Shultz, coordinator of career development. Penn College’s Bardo Gymnasium teems with activity during a recent career fair that attracted about 210 employers offering more than 2,400 jobs and internships to students and alumni. Longtime career fair participants agreed. Adam J. Yoder, an account manager at Honeywell Building Solutions, graduated from Penn College in 2011 with a bachelor’s degree in building automation technology. He attended eight career fairs as a student and has represented Honeywell at the past five events. Honeywell is targeting building automation, information technology and electronics students for 70 openings in its east region, according to Yoder. David Rellinger has represented Schneider Electric at the career fair for the past six years. The general manager for his company’s New York-New Jersey office said this year’s fair “by far” was the most crowded as he recruited information technology and electrical technology students. “We have 20 openings just in the tri-state area. From a national standpoint, we likely have over 100 openings,” he said. A survey conducted by the National Association of Colleges and Employers revealed that employers anticipate hiring 8.3 percent more new college grads from the Class of 2015 than they did from the Class of 2014. Graduates in engineering, computer and information sciences, business, and math and science disciplines are projected to be most in demand. Employers said Penn College students are consistently in demand because of their hands-on, technical experience, coupled with theory-based instruction. “The best thing by far is their relevant coursework and experience in the field. We hire for building automation, and you have a program here specifically designed for that,” Rellinger said. Like Yoder, Terrence A. Heim values Penn College as an alumus and employer. He graduated in 2012 with a bachelor’s degree in aviation maintenance technology and returned to the college representing Agape Avionics. “One of the things that Penn College thrives at is training students for their field. The people who come out of here have the skills and knowledge for what we need as a business,” he said. Nearly 1,200 students attended the spring career fairs, according to Shultz. She said she is hoping for a similar turnout by both students and employers for the next ones scheduled for October. Christopher P. Brennan, a 2014 graduate in residential construction technology and management: building construction technology concentration, talks with former Toll Brothers Inc. intern Mark A. Lapszynski, a residential construction technology and management major from Kennett Square. While readily displaying its athletic roots, Bardo Gym is transformed into an arena for another type of interaction. Timothy M. Richard, a construction management student from State College, makes an impression with the McLean Contracting Co.
American Infrastructure represents an occupational possibility for Eli W. Getgen, a civil engineering technology major from Williamsport. … and Giovanna M. Daniele. enrolled in business administration: management concentration. Working toward his degree in residential construction technology and management, Alexander S. Eckerd, of Elizabethtown, weighs his options at the Dan Ryan Builders display. Erica L. Schreffler, a 2012 alumna in building science and sustainable design, outlines opportunities at Solar Innovations Inc.
A pair of well-dressed job-seekers stops by the Hensel Phelps booth. Building automation technology student Christian H. Dressler, of Mifflintown, visits the Mazzetti Inc. booth. Employers break for lunch, gathering sustenance for their meetings with tomorrow’s hires. Logan M. Tubiello, an Ottsville resident majoring in welding and fabrication engineering technology, visits with a representative of Kiewit, where he served an internship. Danielle M.Liddic, coordinator of employer/industry relations, networks with vendors at the Acero Precision booth – including Penn College alumnus Mathew D. Johnson, who graduated last year with a degree in manufacturing engineering technology. Congratulations on your successful event. You all do a wonderful job. I appreciate all you do to help me and my students as well.